Ancient rivalries and feuds that span generations have long guided the course of the Galactic Civil War, deciding the fates of thousands of beings on countless worlds. Yet there are more rivalries to be found than the obvious lines drawn between factions. There is opposition between order and chaos, between the physical and the intellectual, between those who stand alone and those who work together with their friends. 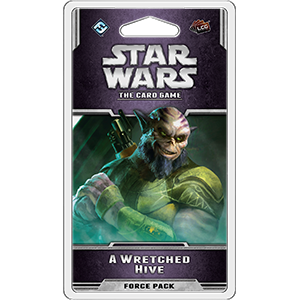 You’ll get a closer look at these and plenty of other interactions in A Wretched Hive, the second Force Pack of the Opposition cycle for Star Wars™: The Card Game.